Iranian artworks are sold 100 percent at the 2015 Christie’s Dubai Auction. The New Year got off to a good start for Iran’s visual arts as Iranian artworks – 27 items in all – were sold at the Christie’s auction of Modern and Contemporary Arab, Iranian and Turkish Art which was held in Dubai on March 18. The auction proved a success for Iran which for the first time managed to auction off all its items. It was not the case for the Arabs and Turks, though; at least 30 of 131 works up for auction by Arab and Turkish artists remain unsold. 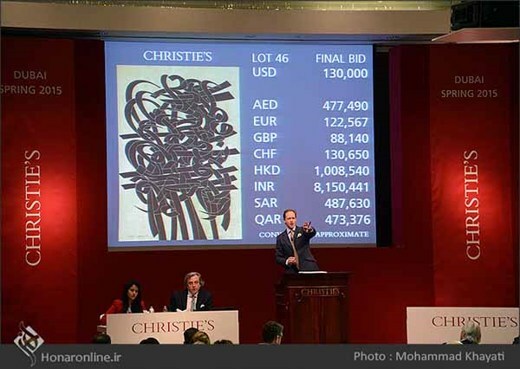 Christie’s five-day Auction opened in Dubai on March 15 and welcomed over 500 art collectors and enthusiasts to its 18th consecutive sale season in the region.